If you would like to import surgical,medical instruments and accessories, necessary permission or no objection certificate from Drug controller of importinig country is essential. The importers of surgical and medical accessories or instruments may collect the details from government agency of importing country and collect proper and necessary information on such importation requirements. Some of the items like night vision binoculars and passive night vision devices (PNVs) covered under this section are restricted and can be imported only against an import authorization from foreign trade office of respective importing country. Hazardous Wastes management, handling and Trans boundary movement rules. Each country has their own foreign trade policy to import Optical, Photographic, Cinematographic, Measuring, Checking, Precision, Medical or Surgical Instruments and Accessories in to their country. However, most of the countries have Hazardous wastes management, handling and tans boundary movement rules or similar authority that regulates imports and consumption of Optical, Photographic, Cinematographic, Measuring, Checking, Precision, Medical or Surgical Instruments and Accessories in their country. 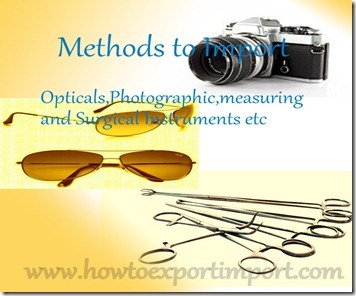 Any importer who would like to import Optical, Photographic, Cinematographic, Measuring, Checking, Precision, Medical or Surgical Instruments and Accessories should follow the terms and conditions of such hazardous wastes management, handling and Trans boundary movement rules before actual import of Optical, Photographic, Cinematographic, Measuring, Checking, Precision, Medical or Surgical Instruments and Accessories takes place. Almost all countries have environment department to regulate importation, consumption and usage of materials effecting environment. Permission from such environment department of importing country is essential to import some of the items under Optical, Photographic, Cinematographic, Measuring, Checking, Precision, Medical or Surgical Instruments and Accessories. In India, Ministry of Environment and Forest (MOEF) is the authorized government agency to regulate such materials including importation. Test report of analysis from Laboratory to import Optical, Photographic, Cinematographic, Measuring, Checking, Precision, Medical or Surgical Instruments and Accessories. For the purpose of importing Optical, Photographic, Cinematographic, Measuring, Checking, Precision, Medical or Surgical Instruments and Accessories, the importer must obtain a test report from accredited laboratory authorized or governed by importing country is required. Necessary sample of imported Optical, Photographic, Cinematographic, Measuring, Checking, Precision, Medical or Surgical Instruments and Accessories is drawn as per the procedures and rules of importing country and submits with such authorized laboratory and obtains analysis report. Normally three sets of samples of importing Optical, Photographic, Cinematographic, Measuring, Checking, Precision, Medical or Surgical Instruments and Accessories are drawn and forwarded to laboratory notified by environment and forest department. Test report retains for minimum two years to confirm on obligation fulfillment by importer on importation of Optical, Photographic, Cinematographic, Measuring, Checking, Precision, Medical or Surgical Instruments and Accessories articles. Such certificate is submitted with customs location of importing country to process importation of Optical, Photographic, Cinematographic, Measuring, Checking, Precision, Medical or Surgical Instruments and Accessories. If non fulfillment of obligation by importation of Optical, Photographic, Cinematographic, Measuring, Checking, Precision, Medical or Surgical Instruments and Accessories, the importer should re-export the hazardous waste within 90 days from the date of arrival in to importing country as per hazardous waste management, handling and trans boundary rules. If any of the imported hazardous Optical, Photographic, Cinematographic, Measuring, Checking, Precision, Medical or Surgical Instruments and Accessories are not followed the necessary norms of importing country, such imported Optical, Photographic, Cinematographic, Measuring, Checking, Precision, Medical or Surgical Instruments and Accessories have to be destroyed or to be removed out of importing country. Such non compliant imported hazardous Optical, Photographic, Cinematographic, Measuring, Checking, Precision, Medical or Surgical Instruments and Accessories may be also fined by imposing penal charges, apart from destruction or return to origin country. As per Hazardous Wastes management, handling and Trans boundary movement rules, the hazardous waste goods are moved as per form 9 specified by importing country. Import of Weights and measures. If any Import of weights and measures as defined under the legal metrology act, 2009 is subject to compliance of provisions of the said act and the rules made thereunder. Import of weights or measures, either singly or as a part or component of a machine, that do not conform to the standards of weight or measure as prescribed under the Legal Metrology Act of importing country. Registration to act as an Importer: Government registration is required to become an importer in the country to act as an importer. Foreign Trade government office of respective country is responsible to issue such authorization to become an importer. In India, IEC number (Import Export Code Number) is obtained from the office of Director General of Foreign Trade office to operate as an importer and exporter in India. Registration procedures to act as an importer are a onetime process, but renewal may be required as per the terms and conditions of such foreign trade office of a country. In most of the countries, the information on such registration for importer – exporter is linked with customs location and reserve bank, as process of imports and exports are online digitalized. So the importer of Optical, Photographic, Cinematographic, Measuring, Checking, Precision, Medical or Surgical Instruments and Accessories is also required to contact concerned government agencies of their importing country to verify whether such onetime registration is necessary or not. Procedures to import: As per the mutual agreement between buyer and seller, the import shipment is taken place. Pricing, quality specifications, terms of payment, terms delivery, mode of transport and other terms and conditions are agreed and mentioned in purchase order and import shipment of Optical, Photographic, Cinematographic, Measuring, Checking, Precision, Medical or Surgical Instruments and Accessories is effected accordingly. As you know, under any importation of goods, necessary import documentation and customs clearance procedures at importing country have to be completed either importer’s customs broker or importer directly as per foreign trade policy of respective importing country. For importing Optical, Photographic, Cinematographic, Measuring, Checking, Precision, Medical or Surgical Instruments and Accessories also, import entry documents along with carrier’s document (Bill of Lading /Airway bill), commercial invoice, packing list, certificate of origin and other required documents are filed and necessary import procedures are completed to take delivery of imported goods under Optical, Photographic, Cinematographic, Measuring, Checking, Precision, Medical or Surgical Instruments and Accessories. Nowadays, necessary information is filed online and produces required documents at the time of inspection, assessment or delivery of import of goods at destination customs location. The international partners of countries share quality measures each other and exempt from multiple inspection on same products both for export and import. However, as per the policy of most of the developed countries import of goods from Least Developed Countries (LDC) need to be certified by authorized agencies before export. So, if any import of Optical, Photographic, Cinematographic, Measuring, Checking, Precision, Medical or Surgical Instruments and Accessories takes place, the details of such information can be obtained from necessary government agencies of importing country. Certificate of Origin to import Optical, Photographic, Cinematographic, Measuring, Checking, Precision, Medical or Surgical Instruments and Accessories: The source of origin of imported Optical, Photographic, Cinematographic, Measuring, Checking, Precision, Medical or Surgical Instruments and Accessories is required in almost all countries. So a certificate of origin issued by necessary approved authorities at exporting country is required to import Optical, Photographic, Cinematographic, Measuring, Checking, Precision, Medical or Surgical Instruments and Accessories. Certificate of origin helps to determine origin of imported goods to avail exemption on import duties and taxes. Different unilateral, multilateral and bilateral agreement between countries also allows imports and exports with exemption of import duties where in Certificate of Origin is the primary proof on country of origin of importing goods under Optical, Photographic, Cinematographic, Measuring, Checking, Precision, Medical or Surgical Instruments and Accessories. The countries each other may have bilateral, multilateral and unilateral agreements which exempt documentation and rates of import tax and duties. The importers have to collect accurate information from necessary government agencies before import of Optical, Photographic, Cinematographic, Measuring, Checking, Precision, Medical or Surgical Instruments and Accessories. Some of the materials are prohibited to import in some countries based on their foreign trade policy on imports. So importer can cross check the requirements of import of their products before placing order with overseas buyer. In this article, the documentation, process and formalities to import Optical, Photographic, Cinematographic, Measuring, Checking, Precision, Medical or Surgical Instruments and Accessories are explained. As explained above, this information is generally applicable for all countries to import Optical, Photographic, Cinematographic, Measuring, Checking, Precision, Medical or Surgical Instruments and Accessories. 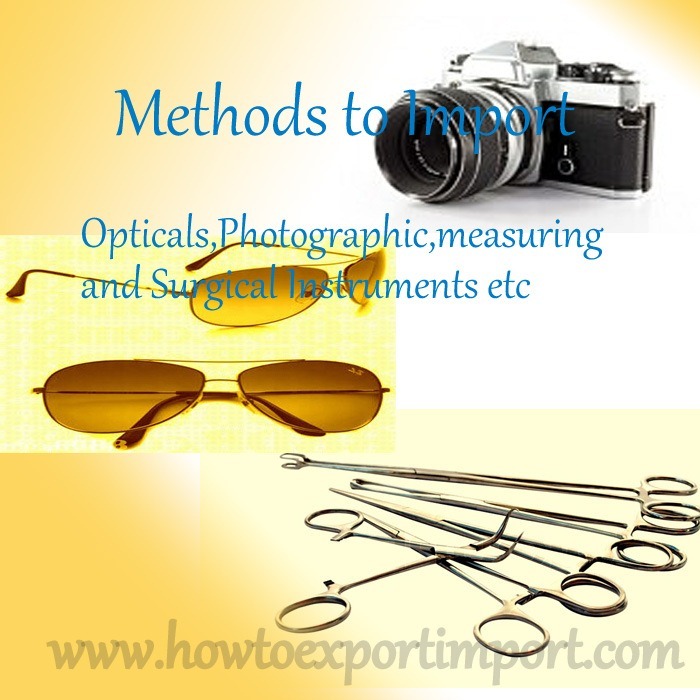 These details on how to import Optical, Photographic, Cinematographic, Measuring, Checking, Precision, Medical or Surgical Instruments and Accessoriesare given to provide a basic idea to bring vegetables from foreign country. Specific requirements for each importing country need to be followed by importers and exporters of Optical, Photographic, Cinematographic, Measuring, Checking, Precision, Medical or Surgical Instruments and Accessories. Have you satisfied with this post about basic information on documentation, procedures and formalities in importation of Optical, Photographic, Cinematographic, Measuring, Checking, Precision, Medical or Surgical Instruments and Accessories. Would you like to comment your thoughts on this article about Optical, Photographic, Cinematographic, Measuring, Checking, Precision, Medical or Surgical Instruments and Accessories? Share below your experience in importing Optical, Photographic, Cinematographic, Measuring, Checking, Precision, Medical or Surgical Instruments and Accessories from overseas country. Spelling error in LC? Is wrong spelling a discrepancy under Letter of credit? How does First Appraisement system of import customs clearance procedures work? Import guidelines to foreign buyers of Optical fibres, optical fibres bundles and cables. How to import Sheets and plates of polarising material? What are the procedures to import Contact lenses? Import clearance formalities of Spectacle lenses of glass. Tips to importers of Polarised glass. Processes to import Spectacle lenses of other materials. Can I import parts of Optical calcite crystal. Is import of cameras, projectors or photographic enlargers or reducers permitted?. Import clearance procedures of Filters. Import documents require for Frames and mountings. Customs procedures to import SPECTACLES, GOGGLES AND THE LIKE, CORRECTIVE, PROTECTIVE glases. How to import Sunglasses?. Processes to import Binoculars. Licenses required to import Monocular and refracting telescopes. Government rules to import Astronomical instruments. Tips to overseas buyers of Parts and accessories. Government licenses required to import Parts and accessories Of binocular or telescopes of heading. Methods to import Parts and accessories Mountings for astronomical instruments. Import procedures to bring Cameras of a kind used for preparing printing plates or cylinders. Shipping procedures to import Cameras specially designed for underwater use, for aerial survey or for medical or surgical examination of internal organ. Import tips to foreign buyers of comparison cameras for forensic or criminological purposes. Importation of lens view-finder [single lens reflex (SLR)] for roll film of a width not exceeding 35 mm. How to import Instant print cameras. Can I import Fixed focus 35 mm cameras? Guidelines to importers of Fixed focus 110 mm cameras. Formalities to import Parts and accessories. Shipping procedures required to import For cameras. How to ship CINEMATOGRAPHIC CAMERAS AND PROJECTORS? Guidelines to overseas buyers of Projection screens. Import guidelines to foreign buyers of Stereoscopic microscopes. How to import Side Projectors? What are the procedures to import MICROSCOPES OTHER THAN OPTICAL MICROSCOPES; DIFFRACTION APPARATUS? Import clearance formalities of Electron microscopes. Tips to importers of Telescopic sights for fitting to arms. Processes to import Periscopes. Can I import parts of Lasers, other than laser diodes. Is import of Liquid crystal devices (LCD)permitted?. Import clearance procedures of Direction finding compasses. Import documents require for Echo sounding instrument. Customs procedures to import Sextants. How to import Rangefinders. Import guidelines to foreign buyers of GAS, LIQUID OR ELECTRICITY SUPPLY OR PRODUCTION METER. How to import INSTRUMENTS, APPARATUS AND MODELS, DESIGNED FOR DEMONSTRATIONAL PURPOSES? What are the procedures to import Electricity meters? Import clearance formalities of Acupuncture apparatus. Prakash Kalwankar: On 14 April 2016 We want to import surgical instruments from German exporter. We will make payment through bank remittance. Payment will be approximately around INR 30 lakhs.We have one query that after transferring amount to German Exporter's company account through bank remittance and then if German exporter didn't send the goods to us then what will security of our transfer money??? what will be the security of our money if we didn't get goods then how we can recover our money back from German Exporter. Is there any solution to ensure our money in case of fraud.Please guide us regarding our query. Import Excise duty changes in Indian Union Budget 2015-16, under Chapter 90,OPTICAL, PHOTOGRAPHIC, CINEMATOGRAPHIC, MEASURING, CHECKING, PRECISION, MEDICAL OR SURGICAL INSTRUMENTS ACCESSORIES.